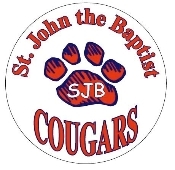 ST. JOHN THE BAPTIST COUGARS MAGNET is a must for all parents, students, faculty, staff, alumni and friends of SJB. Show that Cougar Pride as you travel on Long Island and beyond. It's amazing to feel that SJB family connection when you're driving to school or traveling far from home. Be sure to get one for each car, your refrig, your mailbox....endless possiblities.